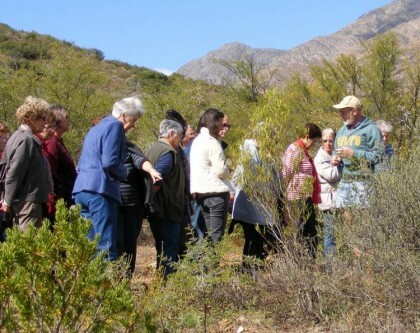 30 members of the Riversdale Garden Club recently set off at the crack of dawn to visit Montagu. Their first stop was the historic Joubert House on Long Street where they enjoyed tea, history and herbs (but not all in th same cup). They then embussed to the Montagu Nature Garden where they learnt of the long history, background and present situation of the Garden. Sander Hahndiek, the co-author of the new Management Plan for the Garden, gave an update of the recent activities which have given the garden its present character and the conservation and environmental aims for the future. Sander then took our guests along the 1.7 k Bessiekop Trail to enjoy the great variety of fynbos plants and the spectacular views of the town and surrounding valleys and mountains. The resultant enthusiastic responses were that they would like to have a similar amenity in Riversdale. The visitors ended their outing by lunching at the Kloof Padstal in Long Street and I am sure the word will get around ... "Want a good day out? Then go to Montagu!!"